Posted on May 24, 2018 by Anmol K.
A Doll’s House by Henrik Ibsen is a story that takes place in late 19th century Norway. The main character of the novel is Nora Helmer, and she is married to her husband, Torvald Helmer. She is treated like a doll by her husband, and has no say into any decisions that are made. She is there as a plaything for her husband, and has been molded by society to not have own identity as a person. Despite her characterization as a dim-witted doll, she is hiding a big secret. Nora borrowed money without any permission from either her husband or father in order to help her family while Torvald was sick. This kind of action was unheard of for a woman to do at this time, so she never told her husband from where she got her money from. Once her secret is threatened to be revealed, the course of the novel changes from the depiction of a typical, happy family of the Victorian time to something modern, but not normal for that time. I thoroughly enjoyed this book, even though it was not a typical read for me because it was a novel assigned to me by school. It was an easy read, but the story kept me hooked from the beginning. Initially, I was a bit wary of the way Nora was treated, and just thought of her as silly. However, when her secret was revealed, my opinion of her changed. The rest of the novel was now on a different, more interesting course of action. The ending was not only surprising, but very controversial for that time. I would recommend this novel, regardless if it is assigned or not, for anyone in order to see the importance of this kind of novel at this period in history. 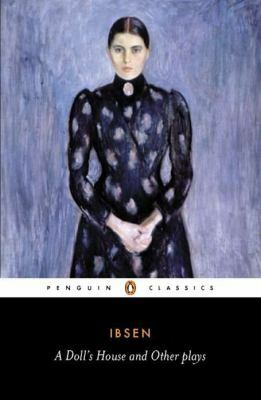 Henry Ibsen’s A Doll’s House is available for checkout from the Mission Viejo Library. This entry was posted in Book Reviews and tagged Fiction, historical fiction, husbands and wives, norway, roles of women by Anmol K.. Bookmark the permalink. Sounds quite like The Handmaid’s Tale!